The cute little Red Backed Kingfisher. Once again these lovely images are from Nevil Lazarus. These sweet little birds can be found just about all over Australia. Just how cute can a bird be? Red-backed Kingfisher, Kilcowera Station on the Dowling Track SW Queensland. 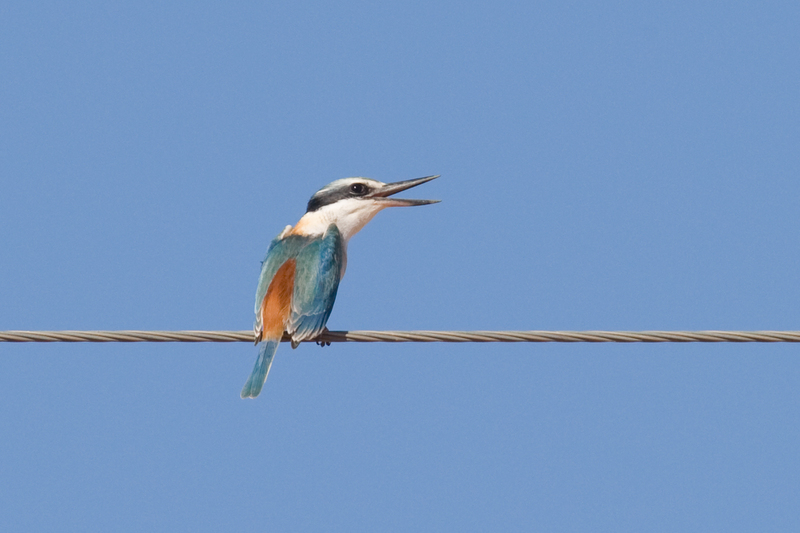 They often sit up on the power lines, calling out in a mournful little voice. I think, because they are always alone they are looking for love. And I’m certain they find it too! Greg down the well fixing things. Many of you will be aware that we have 2 places out here, the other one being Zenonie which is 80,000 acres of mostly mulga shrubland. While Kilcowera is watered by 3 capped flowing artesian bores, Zenonie has 3 sub artesian bores and 5 wells all powered by windmills, so during summer it is a continuing and ongoing job to check each and every watering point at least every second day. With temperatures as high as 48 C during the summer months keeping the water up to the cattle is critical. One little accident can lose all the water in the tank in a matter of a few hours, then if there is no wind to pump more water we have to move stock to another watering point. So many things can go wrong, a beast might knock the float cover off and the float gets stuck and all the water just spills out of the trough in a constant stream until the tank is dry. Or a beast might fall into the trough, can’t get out and dies, it pollutes the water and the others won’t drink it then. So they will stand around bellowing and eventually perish. Greg tells me his heart sinks down to the bottom of his boots if he pulls up at a windmill and hears that low down, unhappy bellowing as it means some disaster has struck. Then there are the little things like buckets wearing out in the pump, or something stuck under a valve, a hole in the columns, the rods might break, something falls down the well and clogs it up or just no wind for days or weeks on end. Today we had to go to the 7 mile well as it has not been pumping much water at all for the last week. Greg thought the intake valve which sits down the bottom of the well in the water might be partially clogged up. He clambers down into the well and sits on this little frame that he’s made and pulls things apart and we haul up the length of poly pipe with the valve on the end. Sure enough it’s encrusted with ….. stuff. Upon closer inspection he decides some of this stuff is snake fat. Now I ask you – why snake fat?? Snakes do live down there, but so do snails and spiders and frogs and bat. Oh well whatever keeps him sane, at least he can have a little joke about things. Well I think he was joking……… however it could have been snails brains or frogs legs or bat wings. Finally some water, more than there was, I hope when the wind picks up so does the water supply!